Good: Fun exciting matches, Teamwork, Plays very well. Hands are tools that help build, but can also destroy. Afterchange is set on a distant planet where two forces duke it out for control over a powerful energy source named quanta. Aftercharge enforcers want to keep extracting this fuel, while the workonics want to stop them. Which side will you choose? Are you a working robot that might have a more human side or do you fight for corporate greed? 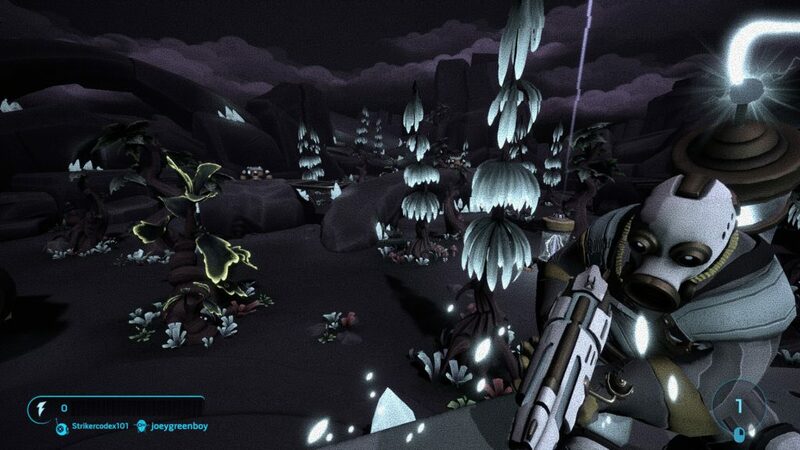 The story takes place on Dusk 11, a rather dangerous but resourceful planet in the galaxy. Because of its high quanta activity, the Aftercharge Corporation decided that it’s the safest to develop and build machines that can do the work for them. And thus came the workonics, machines that build the quanta extractors to gather energy from the planet. All was well until one day the robots turn on their master to destroy all the extractors. Why this happened is uncertain at the moment, as the lore is hidden deep in character backgrounds. There is no flow as you get dropped into the game quite quickly and there is no campaign mode. Having to duke it out somewhere in the galaxy could bring some interesting backgrounds, and this game actually delivers. Each map has its own fauna and flora, from icy landscapes and mesmerizing forests to industrial factory zones. The use of visual filters is a nice addition; when you get disabled as a workonic, your screen turns into this grainy, retro color scheme. It is not only a nice addition but also a clear indicator that you must be revived. Character designs will remind the player of popular culture elements such as Big Hero 6 and Half-Life 2. Furthermore, customizing your warrior with unique color schemes will make it stand out in the chaos and also shows your love and dedication to it. Bathing in the hectic action of gunfire, explosions and electric discharges, this game is not only visually stunning but also very explicit in its audio department. During matches, you will have this nice music in the background to set the mood just right. Sound effects correspond greatly with actions and will make you feel like you are actually there. 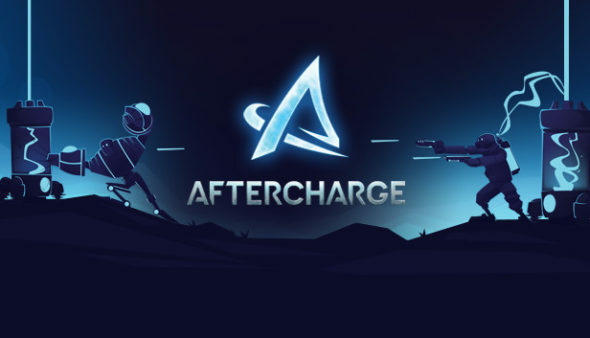 Aftercharge is a team-based first-person action game in which workonics must destroy quanta extractors scattered around the map and the enforcers must do everything in their power to stop them. The game will start by showing you the ropes in its tutorial and you get a great feel for what it is playing as both sides. Now it is time to get online and match your skills with the world. Immediately it is noticeable that for a solely online game, the developers have put a great safety net in place. If you fail to quickly find a filled lobby, the game will have bots for you to play with. These bots will differ in difficulty as the match progresses. The game has two teams battling it out to come up on top. While the workonics are rather fragile, their stealth capabilities prove to be their trump card. If you can’t see the enemy, you can’t hit them. Enforcers on the other side will have powerful weaponry and have tracking devices to disrupt the cloaking machines that the workonics use. Your goal as a robot rebel is to destroy the quanta extractors and it takes ten punches to take one out of commission. As attacking reveals your position, it is in your best interest to plan ahead and use all your tactical capabilities to your utmost advantage. Another weapon in the arsenal of workonics are their abilities. As robots need energy to keep working, you must share your quanta with others and by doing so, you get counters to use said perks. The enforcers on the other team have quite an arsenal at their disposal, but these also require power. It isn’t uncommon that some prefer to stand at an extractor to hog the resources. However, there is always a way. In the selection screen there are five unique characters per team available. As there can’t be two of the same character, you must be ready to learn to play with each of them. 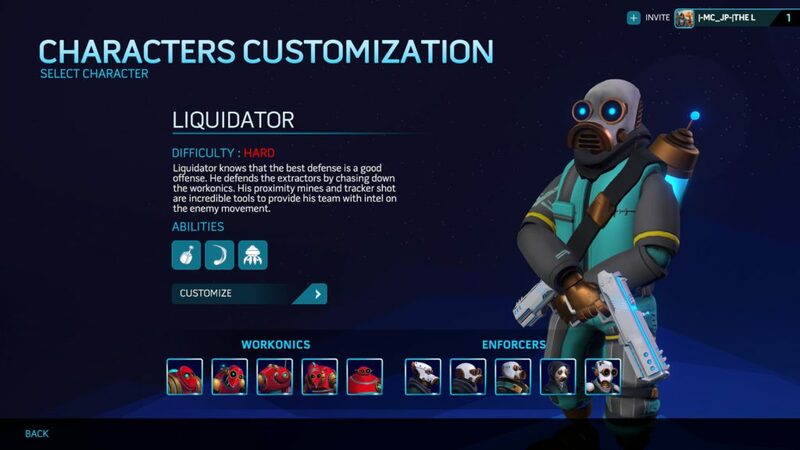 After playing some matches you will also unlock other skins for characters by leveling up, these will let you stand out from the crowd but sometimes these skins only offer minor changes to the color scheme itself. While leveling does only mean cosmetic upgrades, it also is nice to know what type of teammates and opponents you are getting. Lower level indicating newer players while higher lever are veterans of the Quanta galaxy. The fact that character selection is limited is not really that bad since overall balance is quite good. The game starts easy for the robots, as the extractors are fairly scattered and it is harder for the three officers to keep an eye out on each of them. However, as the match progresses, it gets harder and harder for the robots since the enforcers will have an easier task to keep watch over less points. The workonics win by destroying all the quanta extractors, the enforcers win by disabling all the rogue robots. Each match has a time limit and if this chaos isn’t contained within that time, the Aftercharge Corporation will call in an orbital airstrike to end it for once and for all, claiming collateral damage along the way. Playing the game as either workonic or enforcer is smooth, controls respond directly, you have no problem engaging in high-paced combat and everything feels right and responsive. 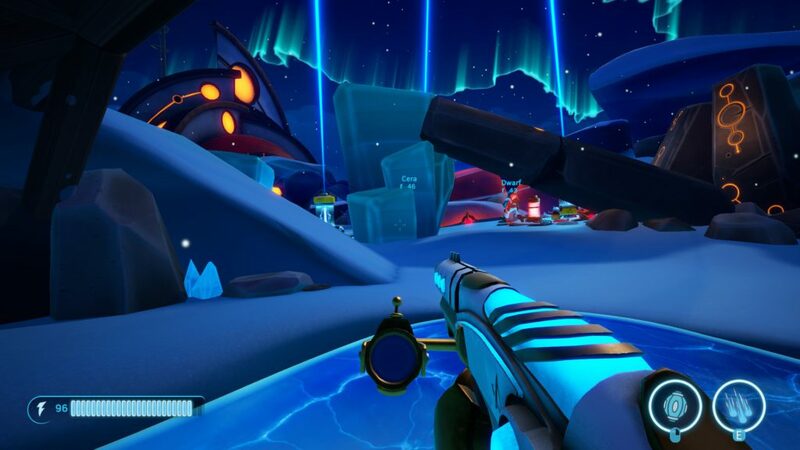 Because the game only has one mode, there isn’t much to discover but the many maps and different play styles other players will surely make each match very unique. 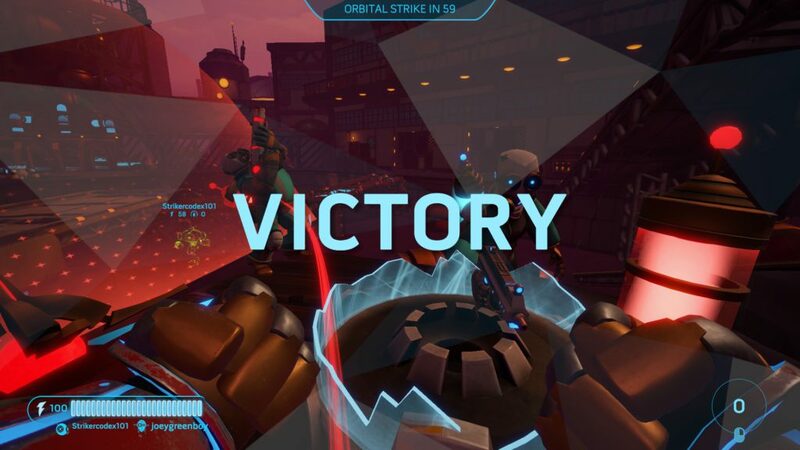 Aftercharge is a game that, although it seemsrather simplistic, does play very well and matches are always fun. Each side has interesting mechanics that don’t get boring after a while and with the lovely graphics and sounds it makes for a fun game to play. You won’t have to wait minutes searching in lobbies: if there aren’t enough players available, you get paired with decent bots, which makes for ideal training grounds. You will level and collect customizations for your robots, but nothing gives you an edge, keeping gameplay fair and fun for everyone.